Sometimes it gets you in trouble, and other times, it gets you the holeshot, and likely the win. 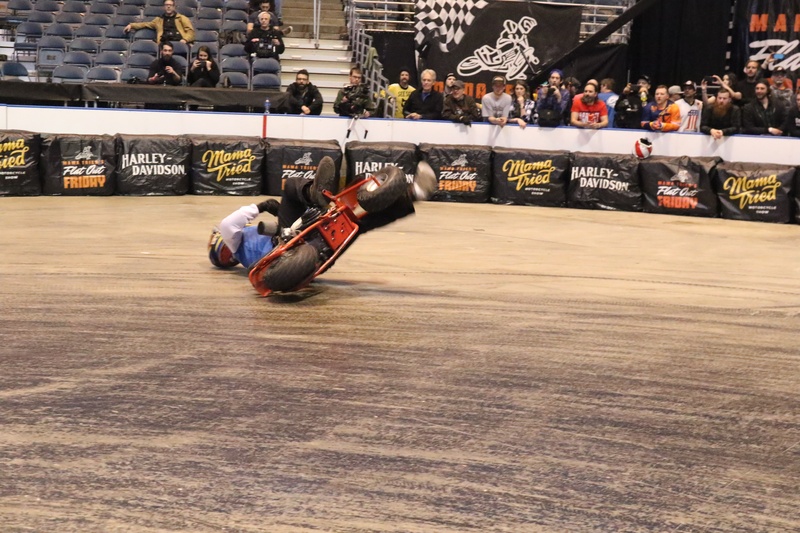 This is the case at the annual Flat Out Friday race in Milwaukee, the night before the Mama Tried Motorcycle Show. 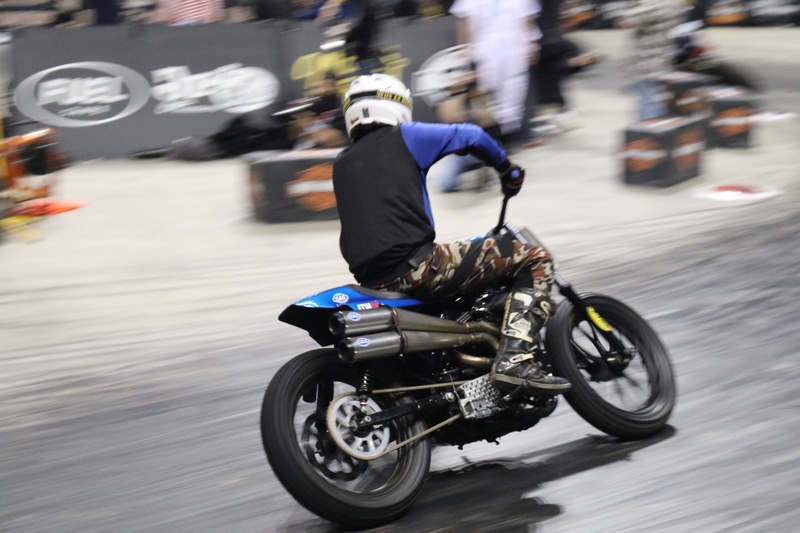 From Hooligans on 750cc+ street twins, like HD® Sportster® and Street® XG750 models to Ducatis, Triumphs, and Indian Scouts, to the "Boonie Bike" pull start class, this is an event not to miss. Period. Early in the day, it's time for practice. 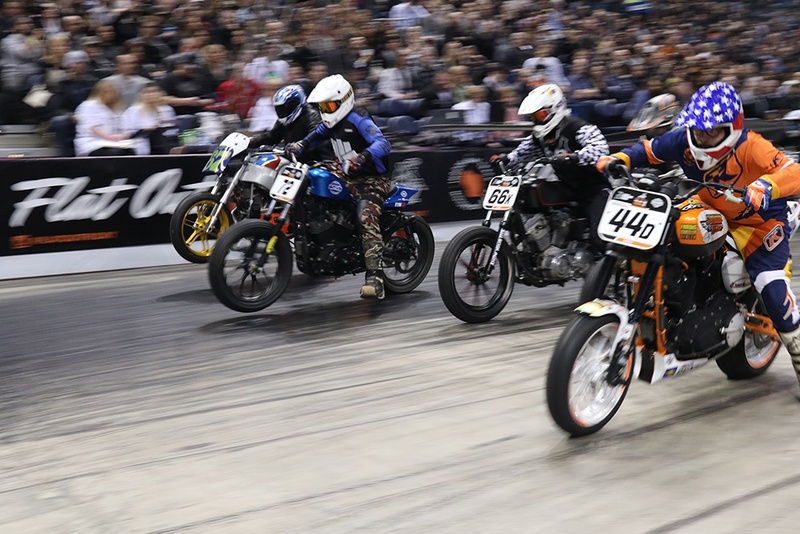 As the machines start up, you can smell the race gas, the sweet stink of 2 stroke exhaust filling the venue. The sounds and smells are something you ONLY get at the racetrack, whether it's flat track, drag racing, or landspeed racing. It's absolutely exhilarating, and something you need to experience in person. So just take my word for it, it's badass. Each class gets practice laps, and a heat. Nearly every class, someone loses traction and goes sliding across the arena, or highsides and tumbles into a pile on the hay bales at the wall. 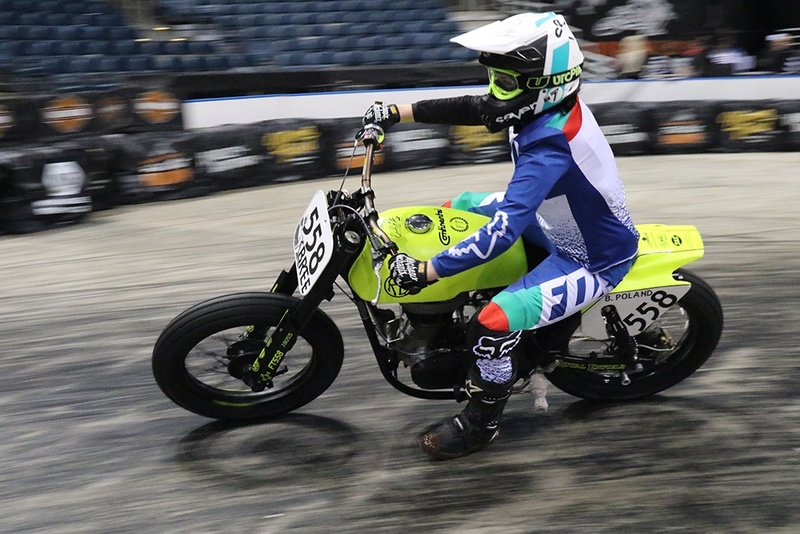 Our own racer, David L, #152 gracefully dismounted his pull-start mini bike - and although it's not S&S equipped, he works in the R&D Department here and put some S&S knowledge into that little bike - even running it on the dyno after hours and fetching nearly 13 hp! 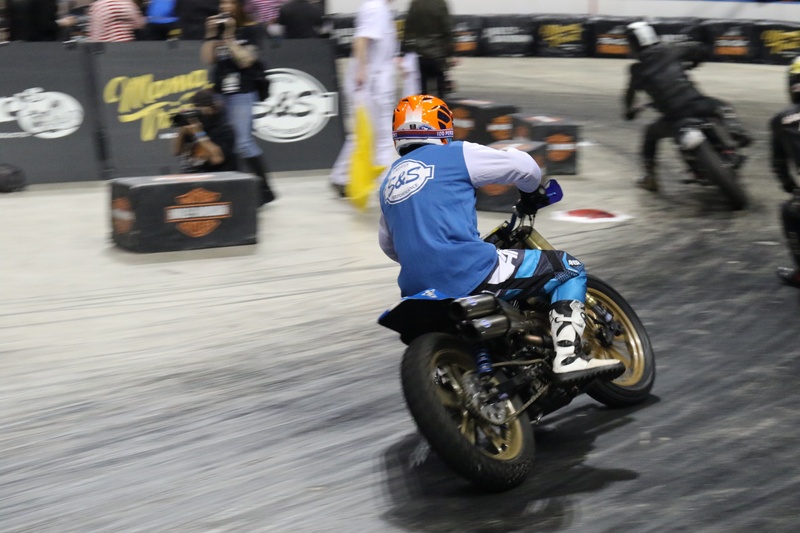 Racers Todd #37x and Hunter,#182 also S&S employees, hit the track on their hooligan rides - both equipped with Hooligan Kits and our new Hooligan High Pipes. 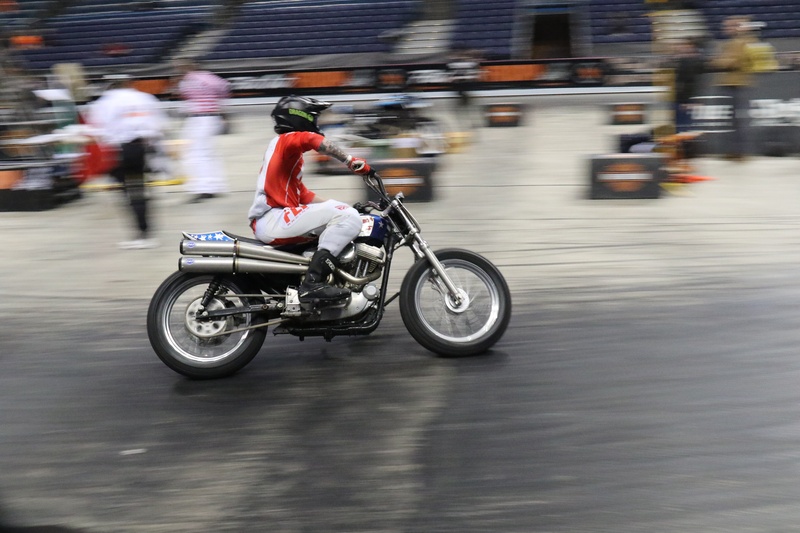 Our racer Jordan Baber, #72, performed quite well on his hooligan machine, usually placing in the top ranks. 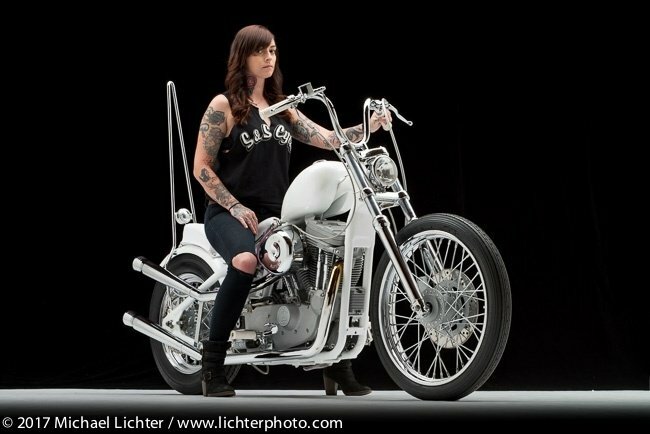 Plenty more S&S equipped riders, from the Suicide Machine Co brothers Sean #66 and Aaron #46, to Vanilla Cycles rider Dan J. 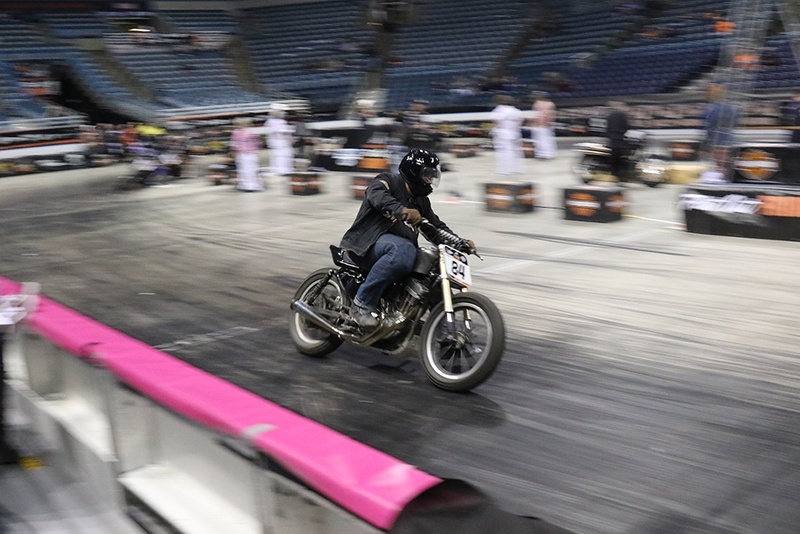 #44x, Ed Subias on his fresh build, Rusty Butcher's entire crew, Jeremy DeRuyter #34 , Benny Carlson #67 on the Suburban HD®bike, and Charlie Stockwell of Warr's HD® build, #115 for the Brewtown Throwdown bike even hit the track! 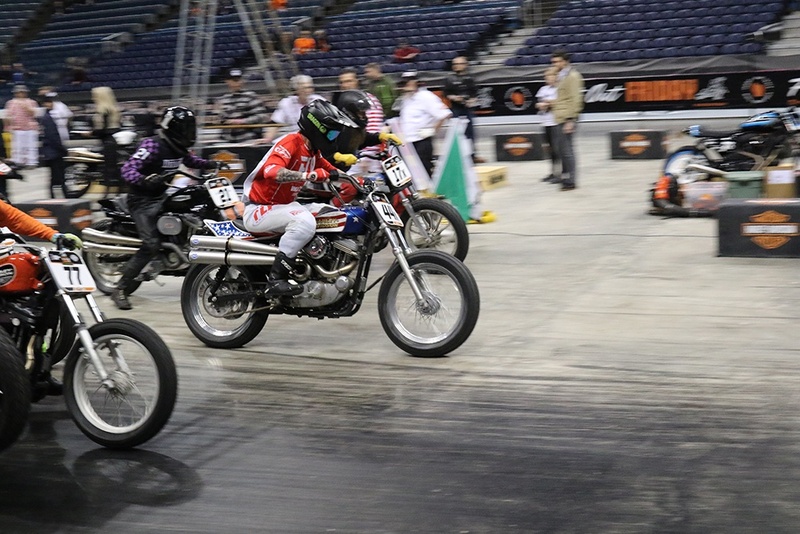 If you looked close, you could even spot a Royal Enfield, with S&S muffler, ridden by first time racer Bree P of Royal Enfield, in the women's class! Oh, and did you spot Larry Enticer on his sled? Yeah, the one who's known for jumping his snowmobile. THAT Larry! He came to SEND IT! 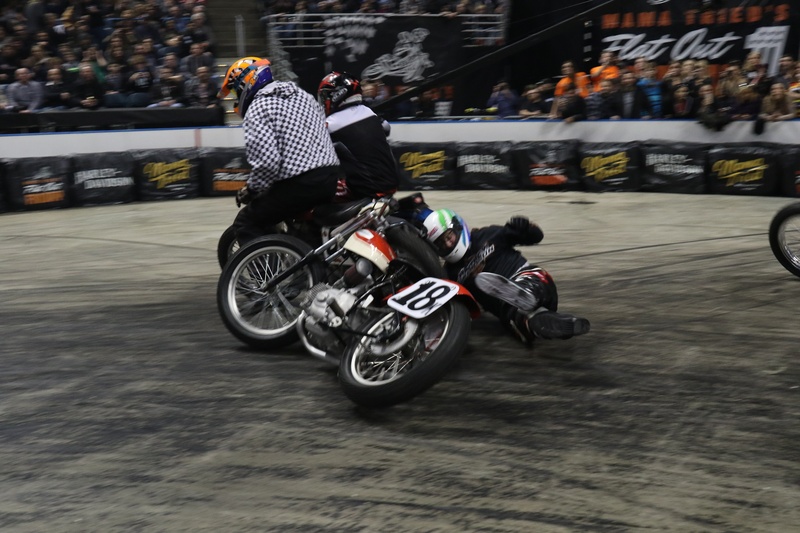 Classes from amateur, to pro, youth, vintage, inappropriate (bringing the best laughs of the night), women's class, and of course the Charlotte Kainz #35L honorary race, honoring the late Kainz, an incredible young female flat track racer, beloved by everyone at FOF. 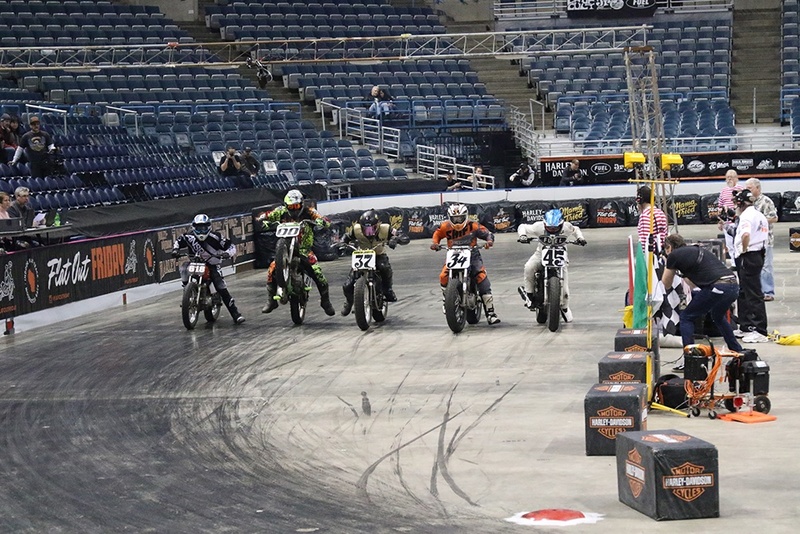 Each heat, semi and main started off with a bang and sometimes a wheelie as the racers strive to get the holeshot, usually a guarantee that you will get the win, barring any exciting close proximity passes, or worse, crashes. 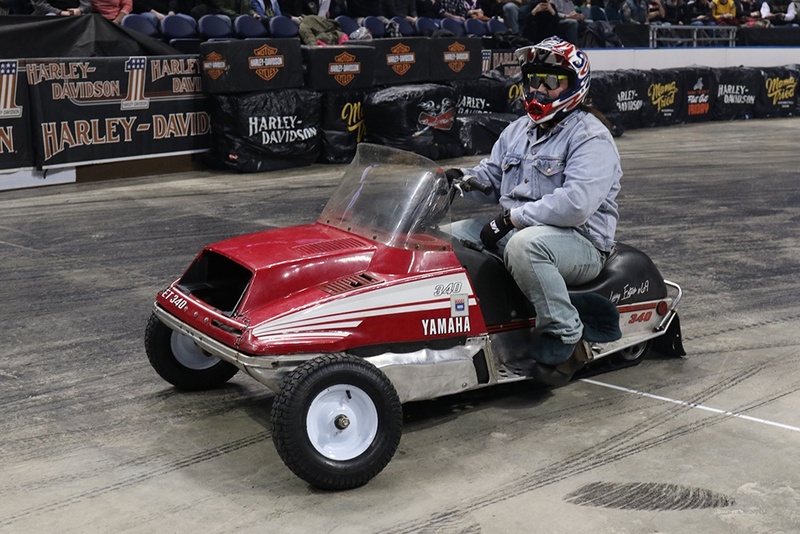 Really, while the professionals are about the win, our Hooligans are about the race, the fun, and showing what you can do on a street legal machine. 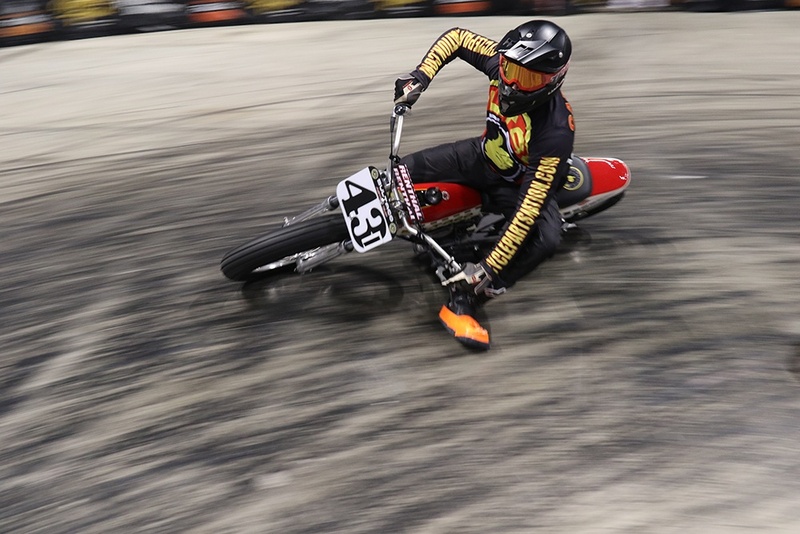 The hooligan class is all about the average guy, and his average bike. 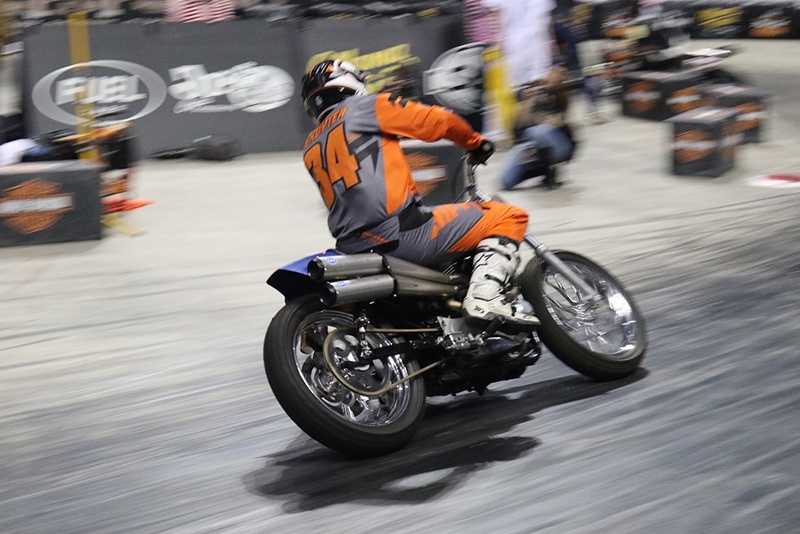 It really started in Southern California, at the Costa Mesa Speedway's "Run what ya brung" night, which brought out Sporty's galore, guys on high-handlebar Softail® models, and even some baggers. Eventually, the core group started what we now know as Hooligan racing. Don't think that doesn't mean the hooligans aren't competitive! 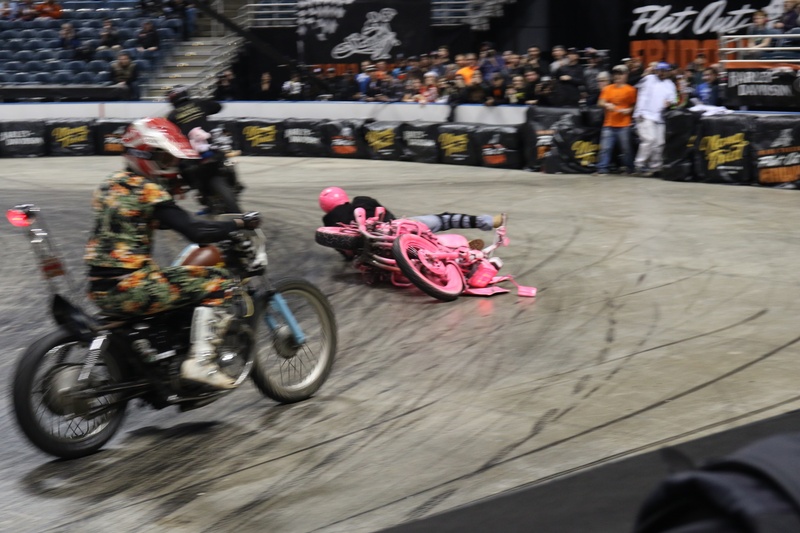 They're out there, bar banging, tire rubbing, and crashing with the best of 'em. Think you've got what it takes to race? We'd love to see you out on the track too. 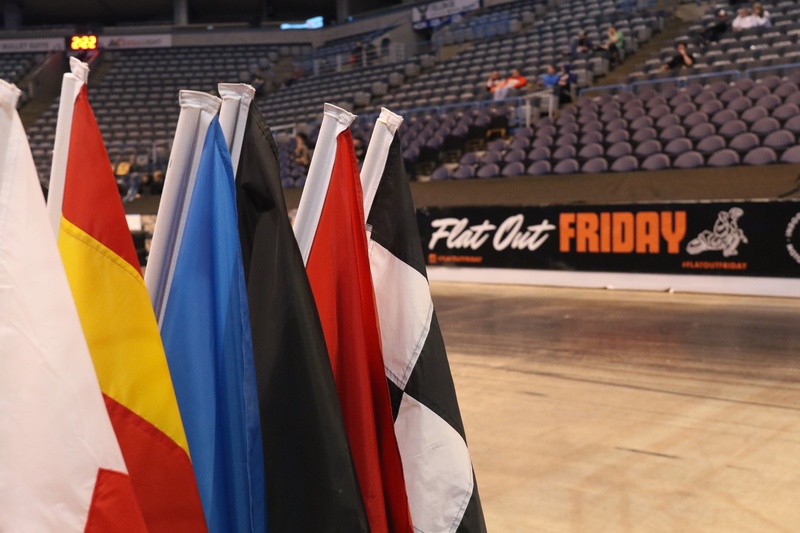 If you're around the Midwest, be sure to check out the upcoming Flat Out Friday events, including on 4/20/18 at La Crosse, Wi, and during the Fuel Cleveland show in July. And check out our recap video of the event!